I'm not gonna lie to ya, I don't have a comprehensive understanding of aromatherapy. It's not that I'm against the idea of using natural methods to help improve mental health or that I'm sceptical if they actually work or not. It's just something which I don't really hear a lot about in the blogging community or from medical practitioners. I guess making sure that you maintain a balanced diet, regularly exercise, get a sufficient amount of sleep and have a good work/ life balance is using 'natural ways' to help your mental health. However, what about Products? I don't know about you, but I've never really thought about using products made out of natural ingredients to help my mental health. That was until Tisserand contacted me. So what exactly is Aromatherapy? Google defines it as " the use of aromatic plant extracts and essential oils for healing and cosmetic purposes." If that definition leaves you as clueless as it did myself when I first read it, let's have a read of what the experts at Tisserand say. 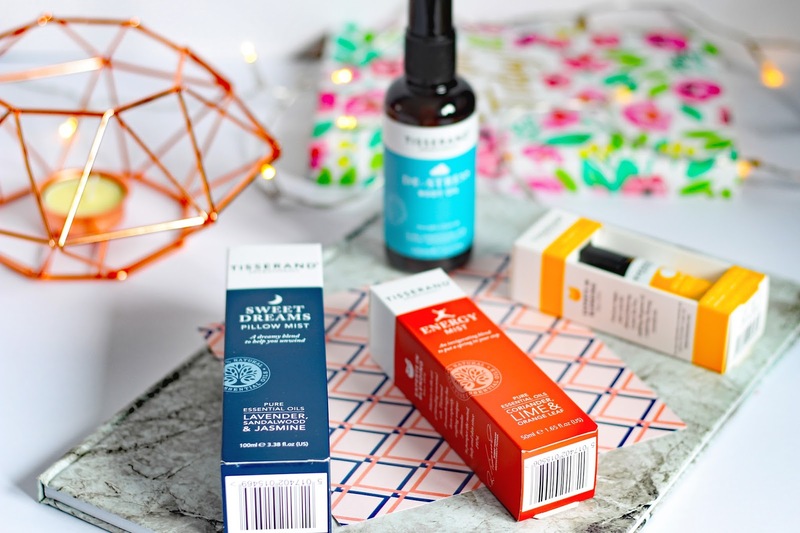 Tisserand ensures that all their products are "straight from nature our essential oils are extracted from flowers, leaves, bark, woods and fruit and are always 100% pure and fresh." You may or may not know that I am working on becoming a more ethical consumer, being kinder to both animals and the environment. I was so delighted to receive these products as a spring in the right direction to do just that. When I found that they can also benefit mental health, I was pretty damn excited. It is important to note that these products are no way claiming to solve your mental health problems. They are no miracle cure that's for sure, but that's okay if you don't expect them to be. The aim of these products is to boost your mood, help you sleep or distress you. There are no fancy claims here, just simple, natural products which if used often will hopefully have a positive impact on your mental health. 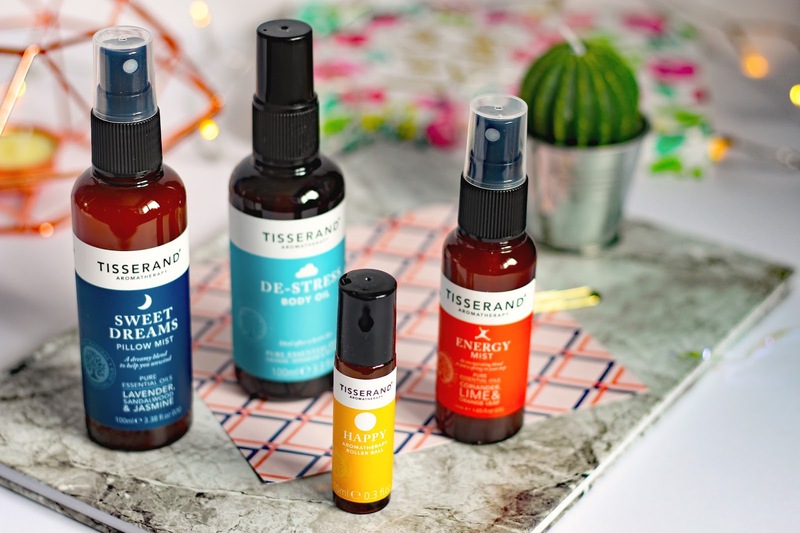 Tisserand does an extensive range of wellbeing, aromatherapy and beauty products, all of which are 100% natural and vegan-friendly. 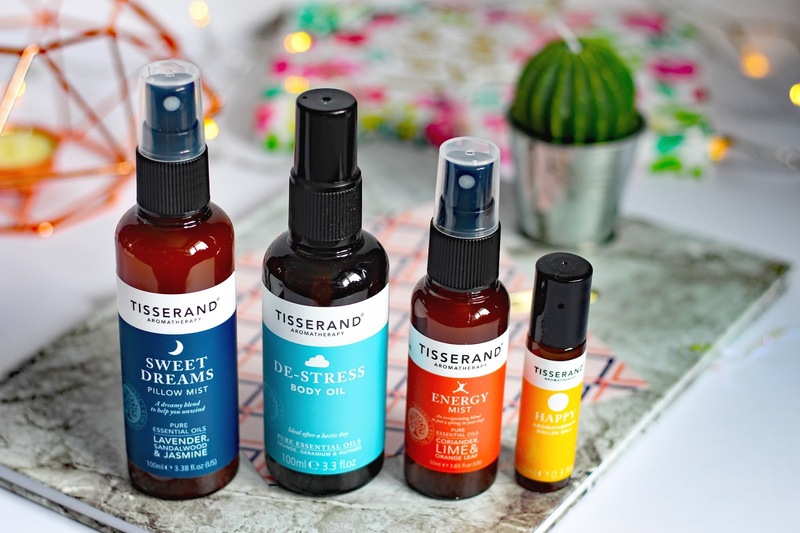 From roller balls to mists and body oils to pillow sprays, Tisserand has covered all bases. What I love about the selection they offer is all their products are split into different ranges, depending on what you are looking for. For example, they have a distressing range, a focus range and even a headspace range. The ingredients are specially chosen for each range to ensure they fulfil what they say they do on the tin. I was lucky enough to be sent four products, which spoiler alert, I love. The idea of using a pillow mist before bed, to help me drift off to sleep easier, never really occurred to me. I have quite a regular sleep pattern, but sometimes when I am particularly anxious or stressed or even excited, I do find it hard to get to sleep quickly. This month has been particularly stressful for me with lots going on and not having enough hours in the day to do it all. However, since I've been using the sweet dreams pillow mist, I have found it has really helped me get to sleep quicker. It contains Lavender, sandalwood and jasmine, which combined create a serenity in my room, helping me unwind. It is safe to say this has become a firm bedside table essential. I am always in need of a bit of energy, let's be honest, who isn't? Work, college and a complicated mental health can be hard to stay on top of at times. In the past, there have been many times when I've been slumped over my desk, with an amount of work beside me as tall as some skyscrapers. In times like this, I wish I had an energy mist. This one from Tisserand has become a firm office staple. When I'm feeling sluggish at 3 pm on a Monday afternoon, I simply whip this out, and it gives me a little boost, to keep on going. Not to mention the coriander, lime and orange leaf in this product smells amazing. Firstly, I was so delighted to get a rollerball because I haven't had one since I bought a Gogirl magazine in 2007 and it was the free gift. God, I miss those days. Secondly, when I read the concept of this was to make me happier my ears stood up like a rabbit, I was very intrigued indeed. We all need a little bit of happiness in our lives, right? Simply roll on your pulse points, which includes your wrists, forehead and back of your neck for a quick uplift and brighten. I can't say this product has made all my problems vanish away, however, just a little sniff of the bergamot and lemon tea tree must do something to the chemicals in your brain because it genuinely is such a lovely smell. It may not solve all the wars and conflict in the world but for a split-second does make me very happy indeed. Last but by no means least, is the de-stress body oil. I have, to be honest, I have used this product the least just because I am pretty lazy when it comes to looking after my body. I don't often find the time to sit down and take some time out my day to pamper myself. I know I should. I'm not the biggest lover of moisturiser because I find most of them are really sticky and don't tend to make a difference to the feel of my legs and arms. However, after trying this body oil, I think I'm going to have a few more pamper sessions very soon. It's super convenient as all you have to do is spray it on your body and rub it in after a shower or bath and simply let the orange, geranium and nutmeg soothe you after a hectic day, which for me is every day. It's safe to say I'm converted. From someone who never considered using natural aromatherapy products before, after trying these few I'm pretty sure I will be trying a lot more in the future. If taking pills or putting lots of products inside your body that you don't know what they contain isn't your thing, I highly recommend trying out aromatherapy products. Have you ever used aromatherapy products? I would love to know which ones you've used and how you found them in the comments below. 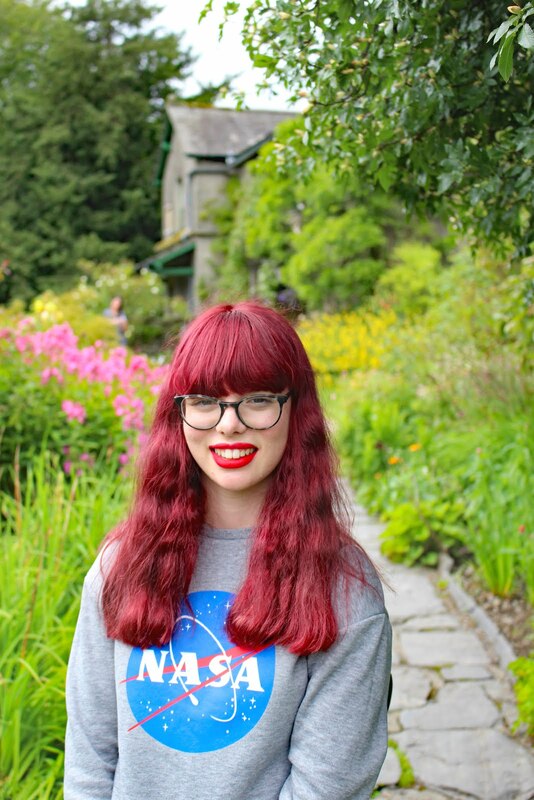 Thank you for sharing this, it was really nice to read :) Aromatherapy is so interesting and I really do need to use it more and learn about it! I have trouble sleeping too so, I really want to buy the sleeping mist - It sounds amazing!!! And furthermore this site must have the setup http in the site address or not. Since now daily part of sites is hacked and your location, installment and therapeutic data will be stolen by any web hoodlums.